Home » Collection » Study for "La Grande Jatte"
(Bernheim-Jeune, Paris). (Alex Reid & Lefèvre, Glasgow and London). Percy Moore Turner [died c. 1951], London, and Oxnead, Gerrards Cross, Buckingham, by 1933 until at least 1937. (Wildenstein & Co., Inc., London, New York, and Paris); Capt. Edward H. Molyneux [1891-1974], London and Paris, probably by 1943; sold 15 August 1955 to Ailsa Mellon Bruce [1901-1969], New York; bequest 1970 to NGA. Reid & Lefèvre handled several sketches for La Grande Jatte of these same dimension, according to the Lefèvre archives, Hyman Kreitman Research Centre, Tate Britain, TGA 2002/11. Lent by Turner to exhibitions in London in 1933 and 1937. According to Rewald and Dorra, Seurat, Paris, 1959, no. 109, Molyneux acquired from Wildenstein in 1943. 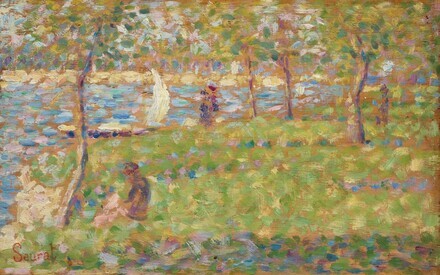 Seurat et ses amis, Paris, 1933-1934, no. 67. Seurat and his Contemporaries, Wildenstein & Co., London, 1937, no. 39. French Paintings of the Nineteenth Century from the Collection of Mrs. Mellon Bruce, California Palace of the Legion of Honor, San Francisco, 1961, no. 57, repro. French Paintings from the Collections of Mr. and Mrs. Paul Mellon and Mrs. Mellon Bruce, National Gallery of Art, Washington, 1966, no. 145, repro. The Pastoral Landscape: The Modern Vision, The Phillips Collection, Washington, D.C., 1988-1989, no. 119, fig. 223. Georges Seurat: The Drawings, The Museum of Modern Art, New York, 2007, no. 109, repro. Dorra, Henri, and John Rewald. Seurat, l'oeuvre peint, biographie et catalogue critique. Paris, 1959: no. 109, repro. Small French Paintings from the Bequest of Ailsa Mellon Bruce. Exh. cat. National Gallery of Art, Washington, D.C., 1978: 78, repro. (continuing exhibition beginning in 1978). Walker, John. National Gallery of Art, Washington. Rev. ed. New York, 1984: 515, no. 776, color repro. Coman, Florence E. Joie de Vivre: French Paintings from the National Gallery of Art. Washington, 1991: no. 28, repro. Grenier, Catherine. Seurat: Catalogue complet des peintures. Paris, 1991: no. 112, repro. Kirsh, Andrea, and Rustin S. Levenson. Seeing Through Paintings: Physical Examination in Art Historical Studies. Materials and Meaning in the Fine Arts 1. New Haven, 2000: 6-7, color fig. 1. Kelly, Franklin. "A Lasting Legacy: The Completion of an Unparalleled Gift." National Gallery of Art Bulletin nno. 51 (Fall 2014): 10-11, repro.